Candidates for the Master Certified Estate Planner™ (MCEP®) program must read and agree to the following terms and conditions (this page in its entirety) before enrolling. APPLICATION & PAYMENT - The completed enrollment application must be accompanied by an enrollment fee in the amount of $1695 less any applicable discounts. The enrollment fee includes the cost of the course, materials, and exam. Candidates may request an enrollment fee payment plan if necessary, however a substantial deposit will be required and no certification will awarded until full payment has been made. Unless other arrangements have been made, the entire enrollment fee is to be fully paid before any course materials are delivered and/or in advance of any participation in any course training provided online or in class. EDUCATIONAL COMPONENT - The course content is delivered through a combination of self study and attorney led instruction. The self study manual is composed 570+ pages broken down into eight topical modules plus appendix materials, and provided in PDF format via hyperlink. The attorney led instruction covers course highlights and practical application, and is conducted via four live interactive online sessions referred to as Online Plus Presentations, totaling 15-16 hours of PowerPoint, diagramming, case studies, and Q & A. Attendance in the live sessions is recommended but not mandatory, and the sessions are recorded and available for review in case of scheduling conflicts. Upon successful completion of the MCEP® program, there are no new requirements or fees for maintaining the use of the MCEP® Certification. 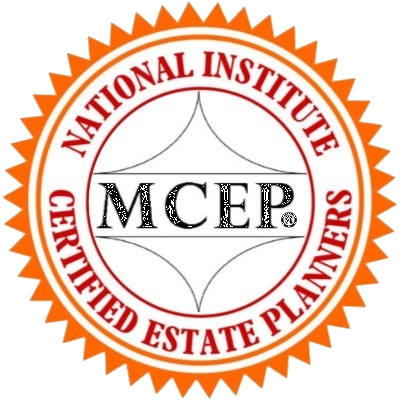 The Master Certified Estate Planner™ (MCEP®) certification, in all forms and logos, is a trademark registered with the Unites States Patent and Trademark Office and is owned and conveyed solely by the National Institute of Certified Estate Planners (NICEP), Inc. This mark is awarded to individuals who successfully complete the NICEP certification requirements and who also comply with the NICEP annual maintenance requirements. The course materials presented in the Master Certified Estate Planner™ program are owned and copy-written by the NICEP, and may not be copied, loaned, or reproduced in any fashion without the expressed written permission of the NICEP, and then only for personal business applications.